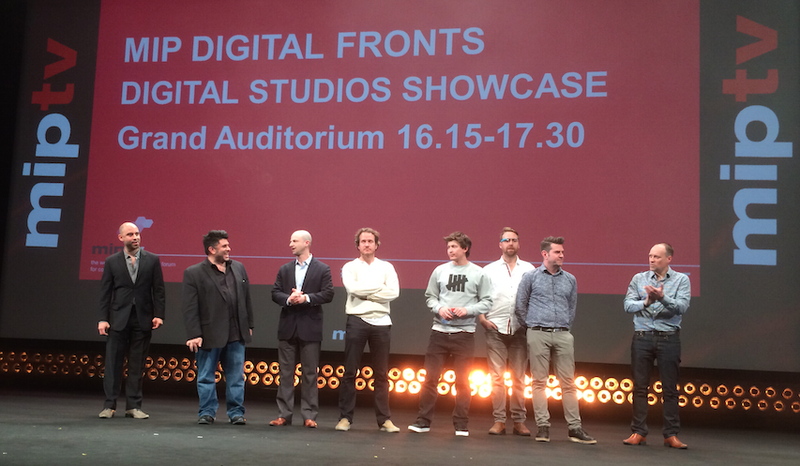 The final session today in the MIP Digital Fronts was a corker: a parade of digital studios showing off their latest shows and formats, hosted by Shira Lazar, co-founder of What’s Trending. Sci-fi, comedy, video games, talk-shows and sports all rubbed shoulders on the Grand Auditorium’s big screen. It’s a co-production with Rocket Jump, a firm founded by YouTube star Freddie Wong. “These series, in seasons one and two, were viewed over 120m times on platforms all across the world,” said Kontonis. Season three is being shot at the moment, shot in a mixture of 24 and 48 frames-per-second. Collective is now bundling up the first three seasons in a 17 x 30 minute package for distribution. Its founder Thomas Bannister explained that he formed the company in 2008, based in LA and New York. It produces shows for various online networks, as well as for brands – Samsung is one of its clients. Besides The Comment Show, he screened Armed Response, SOS Island and Jump Outs, two of the company’s other series. “What we try and do is create programming which is similar to what’s on television or what’s in movies, but with additional elements indigenous to the internet woven into them,” he said. The Comment Show aggregates user comments under the week’s music videos on Vevo, and uses them as jumping off points for skits and comedy. Hewlett explained the production process: “This ties very much into this science fiction world of early-adopting nerds like myself who will really take to these nihilistic worlds and future tech!” he said. The prologue was launched as an app for iOS and Android. And now a Google Glass app too. “We wanted to push the boundaries of that. We were very interested in seeing what is an immersive experience on Glass,” said Bennett. “It’s the best pickup item you can possibly buy a nerd!” said Hewlett, of the experience of wearing Google Glass around MIPTV. “I’m sure my wife is thrilled to hear that… I spend most of my time walking into furniture in the bar!” But Bennett suggested the project is “really thinking about digital natives today, and about how stories do move across multiple platforms”. About 18 months ago, when YouTube was running its original commissions initiative, Bigballs pitched to run a football channel and won: the result was Copa90. “We built Copa90 from scratch without any rights, any associations really, any massive talent. We’ve identified around sports there’s a massively under-served audience that are connected, but actually care about the stories around the 90 minutes… and the stories outside the 90 minutes make the 90 minutes matter more,” said Welsh. “It’s a massive sea-change in the way sports have traditionally been done. It used to e that you needed rights to build an audience… for us, Copa90 is the first in a planned series of channels,” he added. It plays out on Twitter, Facebook and other websites – including its own – giving viewers the chance to solve the case before the TV detective does. Meanwhile, people watching can use the Zeebox second-screen app to get clues as they watch the show. Fans following the show on Facebook will get exclusive clues, that pay off when they watch the next episode. “One of the most exciting things is this is the first time a free-to-air network has commissioned a show from the outset to be a multi-platform show,” said Mayfield, who said Zeebox had been brought in at a very early stage in the project. “It has to be mainstream, it has to actually feel like this is not a new thing for our audiences to learn,” he added. It has 2.3m subscribers on YouTube, but no sponsor yet: that’s what Diagonal View is hoping to sign up at MIPTV. Heiman also explained the licensing deals behind the channel. “We spent the money and time to license all that raw footage from the original IP owners,” he said. Hats off to all the participants of this mammoth session! More from the MIP Digital Fronts tomorrow, only on MIPBlog!